EPISODE 130: What Are You Learning Now? Today I ask a series of questions to help you uncover and discover a new way of looking at what you THINK you KNOW. The first of many questions that we must ask ourselves. No matter what you know today, there’s still more to learn. So often we experience something new and we label it. We create a story about it…and around it. But is it the truth? Perhaps it’s simply an opportunity to grow and learn something new. What are you willing to be open to see? What GROWTH are you willing to experience? So many things we define as hard, impossible, broken are NOT necessarily the TRUTH. Is what you know…what you’re learning serving you well? Is it allowing you to live in freedom? Knowledge of the truth sets us free. What are you willing to see and do today that’s different? 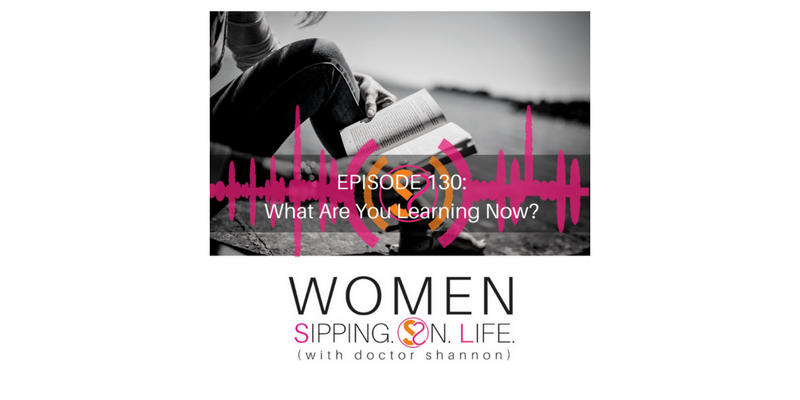 Please come over to WomenSippingOnLife.com for some free resources, including my CHECKLIST FOR CHANGE, Engagement Checklist + Evaluation Rating, Six Sacred S.O.L. DATE Secrets…and a FREE copy of my best-selling book, Date Yourself Well. You can also check out my Dr. Shannon Facebook Page for more daily S.O.L. TRAINING.